At a 15-minute drive from the Cancun International Airport lies the stylish, ultra-modern Breathless Riviera Cancun Resort & Spa. The resort is nestled amidst a dense forest and surrounded by the majestic Caribbean Ocean. With a horseshoe shaped architecture, the hotel is a popular landmark with one of its own aura and entertains only adults. 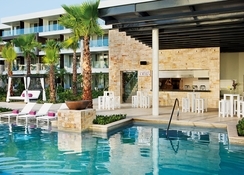 Breathless Riviera Cancun accommodates its guests into 526 chic suites that feature luxurious amenities. 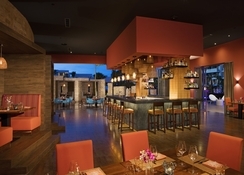 The resort features 10 onsite restaurants that serve delicious cuisines from around the world. The eight bars scattered across the property take care of your drinking requirements. You also get access to a private beach and can indulge in various water sports facilities at the hotel. In the evening, guests can get into vibrant party mood at the Xcelerate Party Zone that hosts live performances by internationally acclaimed DJs. An outdoor pool, a bar and a well-equipped spa and a Jacuzzi add an extra edge to the luxury at the Breathless Riviera Cancun Resort & Spa. 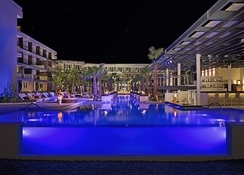 Guests opting for the unlimited luxury all-inclusive packages can enjoy an array of amenities, which include limitless access to dining options, unlimited international and domestic top-shelf spirits, pool and beach wait service, daily refreshed mini-bar and free Wi-Fi. Amid a thick forest, on the shores of the Caribbean ocean, the Breathless Riviera Cancun Resort & Spa is a well-known synonym of luxury. 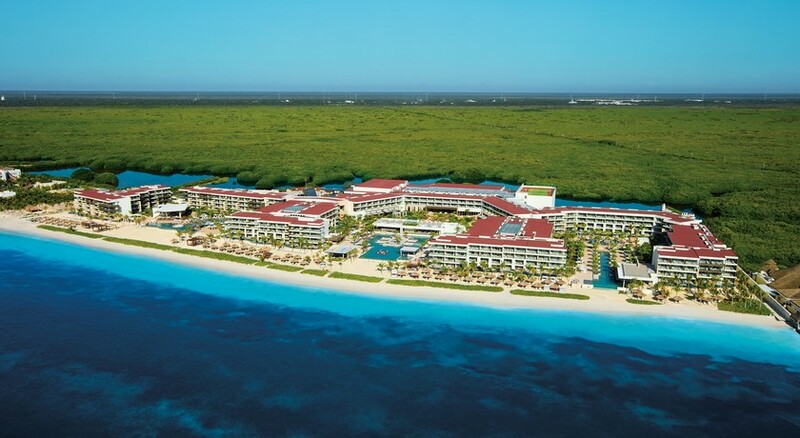 The famous Moon Palace is around 14km from here and the Cancun International Airport is about 20km from the property. 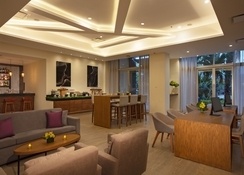 At Breathless Riviera Cancun Resort & Spa, there are 526 suites that are categorized under various names as per their occupancy and facilities. Most of the rooms include private bathrooms with hot tubs, bath robes and slippers. Almost every room offers you panoramic views of the Caribbean Sea or the resort garden. The accommodations are placed differently yet strategically into Suite Zone and Xhale Club. Each of these accommodations features flat screen TV, coffee & tea maker, electronic in-room safe, work desks, telephone and complimentary Wi-Fi. You get to dine at 10 authentic and trendy gourmet dining venues that include six a la carte restaurant, one buffet, a tapas bar, a grill on the beach and a café. The best part – you do not require a reservation at any of these restaurants. The restaurants serve a wide range of cuisines ranging from French, Spanish, Mexican and Italian. There are around 10 bars, where you can sip some the most elegantly prepared alcoholic and non-alcoholic beverages. 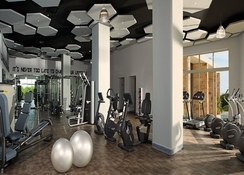 Breathless Riviera Cancun Resort & Spa is an entertainment and sports marvel in Cancun. There is a DJ station that plays music throughout the day in the Xcelerate Party Zone. Guests can take a relaxing swim in the three heated swimming pools that are open from 8am – 8pm or enjoy the 35-person Giant Jacuzzi open from 8am – 8pm, could you ask for more? The resort steps up its game by arranging for golf, tennis beach volleyball, pool tables, aerobics, dance & Spanish classes. You can use cycles (free of cost) to go for a ride by the beach. The private beach also enables this resort to arrange for snorkelling and water sports. At the on-site spa, you can access a state-of-art beauty and wellness treatments.